The Herbert Restaurant epitomizes the style and grandeur of the original house and commands beautiful views over the surrounding landscape. The restaurant is complete with luxury furnishings, flooring and fittings. Our beautiful Bushfield Interior curtains frame the stunning views over the Tomies and Purple Mountains. Our grandeur twinkling Chandeliers are from Tara Crystal Chandeliers. The intricate wallpaper is from Lewis and Wood, London and silver cutlery is from Robert Welch. The perfect surroundings and ambiance to match our exquisite dining. Dinner is served each evening in The Herbert Restaurant. Recently awarded 2 AA Rosettes in recognition of culinary excellence, The Herbert Restaurant uses the finest locally sourced seasonal produce. 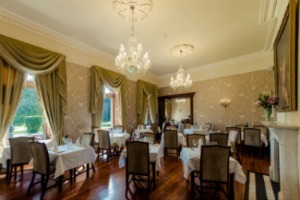 To see what others have thought of The Herbert Restaurant and Cahernane House Hotel, have a look at our reviews. If you are looking for something a little more relaxed, there is the Cellar Bar, located in the basement of the hotel. It offers a selection of wines and beers as well as cocktails and food options. Spent an overnight stay in the cahernane for my friends birthday. Unbelievable 5* service from beginning to end. Mary at reception was exceptional. Room was so spacious, beautiful interiors, so relaxing. Dinner was the best fine dining experience we have ever had. Breakfast was just perfect. Did not want to leave. Amazing hotel. Fantastic staff. Wonderul food. Compliments to the chef. And thank you Mary for being an exceptional host and making us feel so at home. We visit the cahernane hotel as often as we can as the service and food are always excellent - thank you. We had a stunning dinner on Saturday night. Our food was so fresh and delicious and creative. The service was perfectly judged- attentive without being over bearing. The house wines were lovely. I hope we get the chance to dine at the Herbert again. Thank you to all the team! Excellent afternoon tea in beautiful surroundings with service that's second to none. Josephine our waitress was absolutely fabulous and so kind. Mary and Marian at reception were so kind and welcoming. It was certainly a birthday to remember. We were a group of 10 and had a truly exceptional experience. From the bread basket to dessert, every aspect of the presentation and food was truly awesome. Can't wait to go back. 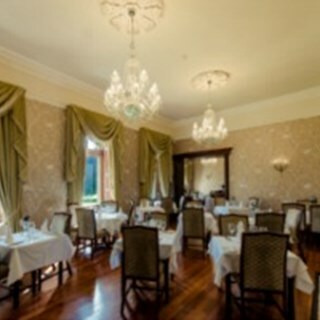 A unique fine dining experience in a beautiful setting, with professional and friendly waiting staff. Very attentive and friendly staff, and the food was beautifully presented, creative and enjoyable. This was a surprise birthday party. We were delighted with the level of attention and service we received. The staff worked hard to ensure everybody had a good time. brought my mother for a beautiful afternoon tea ,the staff were fantastic especially Youre and the ladies in reception were so friendly. Absolutely amazing, wonderful experience, nothing lacking and will be back. Just Grand in all aspects. We had a 5 course menu and really enjoyed it. Each course was very well presented - beating expectations. Some of the combinations were stretching us a bit. Service and atmosphere absolutely top! Overall a great evening for us. We had a lovely meal. The food was really excellent, the courses well paced and the service friendly and attentive without being intrusive... perfect! Lovely dining room with a very pleasant view. We had a lovely afternoon. Thanks for looking after us. I would honestly say this was one of the best dining experiences of my life. I simply can't wait to go back! Lovely setting. Very attentive service. Inventive menu with lots of attention to detail. We were made to feel genuinely welcomed and valued as a customer. Perhaps the only constructive feedback is to offer a greater selection of wine by the glass. Thank you all! Absolutely first class. Excellent food and service was just as good. Loved it. The food and service were fabulous. The staff were so helpful and friendly. A lovely atmosphere in a beautiful room. Will definitely be back.